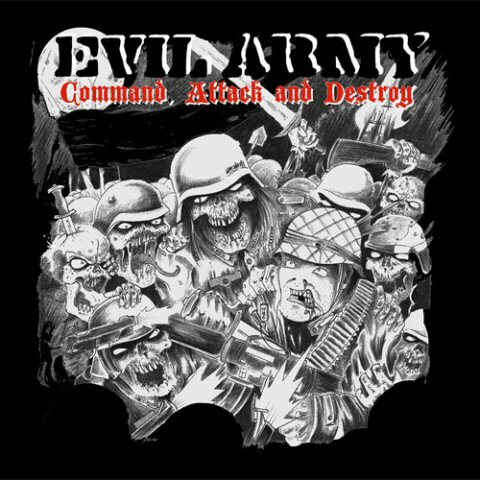 A compilation album from Evil Army, from Memphis Tennessee, featuring all the bands singles, EPs pressed onto one album. 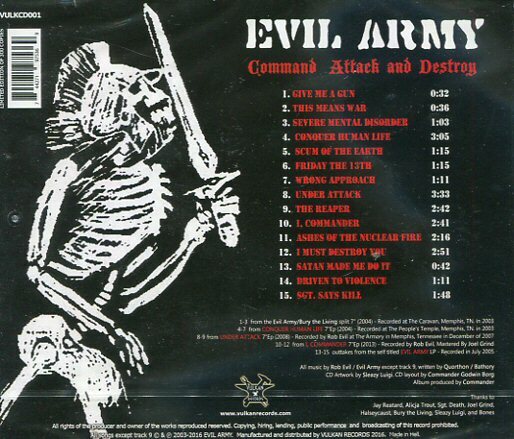 Evil Army is as old schooll as it can be, the sound is raw and uncompromising. Next to this compilation, classics like “Kill’em All” or “Bonded by Blood” feel quite well polished and smooth in production. Evil Army’s no frills, back-to-basics formula which means thrash that are fast and catchy with a punk attitude should probably like this 80s thrash/speed, crossover act. Evil Army is clearly a huge advocate of that proto-German sound, which explains the vocals which are a pretty clear imitation of Tom Angelripper and Mille Petrozza, with a harsh, sleazy bark which sounds like he smokes gunpowder and broken glass like crack cocaine; to the extent, really, that if I didn’t know any better, I’d swear Rob Evil had a European accent much like his idols. The guitar progressions are pure, vicious speed metal in the vein of early Tankard or Iron Angel; dirty tones that sound like they were recorded in a garage somewhere. Fans of records like Endless Pain, Finished With the Dogs, Sentence of Death, Zombie Attack, Obsessed by Cruelty, who seek that sort of authenticity should enjoy this.